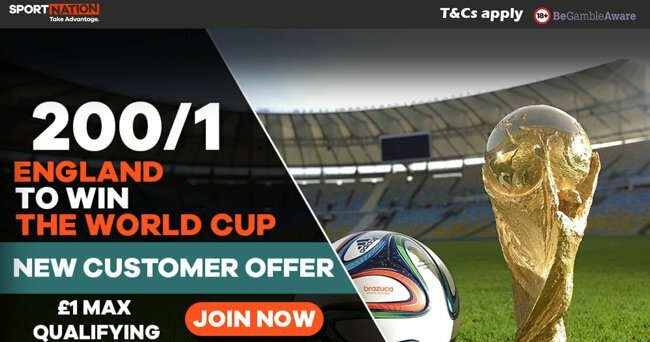 Get 200/1 England to win the 2018 World Cup at SportNation! Best price! England have been drawn with Belgium, Tunisia and Panama in Group G of the 2018 World Cup finals. Fancy the Three Lions to shine in Russia next summer? SportNation are offering a huge price boost - claim 200/1 England to win the World Cup! Max bet £1! England were unbeaten during the qualifying campaign (W8 D2) and have lost twice under Gareth Southgate's stewardship - to Germany and France. The Three Lions having failed to reach the quarter-finals at the last two World Cups. Harry Kane and Dele Alli will be the nation's main hopes. Anyway, there is a high-quality supporting cast. Find below how to claim it! Simply register and deposit through the promotional page. Then proceed to place your bet on 'England to win' in the '2018 World Cup Winner' betting market at standard odds. This offer will expire very soon. Hurry up! 2. 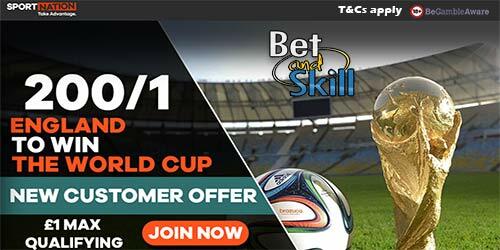 Place a £10 bet (max qualifying stake £1 for enhanced) on England to win the World Cup at normal odds. 3. Bet will be settled at normal odds and bonus funds topped up to 200/1. You will then need to place a series of bets at minimum odds of 2.00 with a minimum stake equal to the combined value of 8x your bonus funds received and once such bets have settled, any bonus funds and winnings remaining will become withdrawal. System bets will not count towards the wagering requirement. 6. Offer expires at the start of the game. "Get 200/1 England to win the 2018 World Cup at SportNation! Best price!"